This creature resembles a gargantuan, grossly obese elephant that had learned to walk upright and then chewed its own forelegs off at the stump. The ground shakes as this vaguely humanoid behemoth teeters into view on great stumps that although massive, are barely able to support its bulk. Its skin is dry, leathered and sickly pink, its chest littered with the debris of a million meals past. Its expansive gut seems as though fit to burst at any second. Its head is elephantine but conveys evil intent shooting venomous glances from behind glowing green eyes. 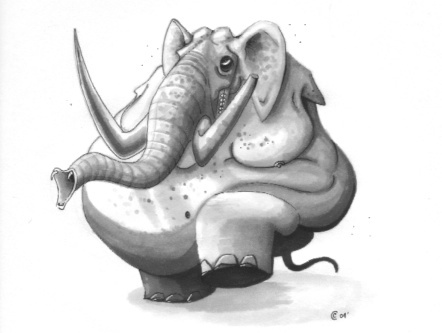 Its great trunk seems to sniff the air in front of it searching for its next meal, while a pair of wicked looking tusks curve menacingly before it. As it nears, a terrible trumpeting assaults your ears while also being greeted by an equally distasteful stench. This creature resembles a great seething mass of vibrant green tendrils attached to the large central maw akin to a giant carnivorous plant. Wisps and trails of a purplish gas seep from the sides of its mouth. Its movement is not unlike that of a scurrying spider and it seems unnaturally fast for a creature of its size. [If the creature has any puppets also read the following] Some of its tentacles entwine captive humanoids, suspending them off the ground like puppets. These victims have palpitating sickly green skin, as if they have become living extensions of the plant itself. [A sadims appearance is often a twisted maniacal parody of the deity whose treasure hoard it sprang from, although they have eight limbs. The following description assumes its parent was humanoid.] This figure resembles a skinny, six-armed humanoid with long bony fingers ending in razor sharp nails. Its skin is lustrous as if the creature were cast of pure gold. Its face wears a broad grin and its eyes are wide and wild, giving it a manic demeanor. The creature is bedecked in regal finery, including crowns, numerous rings and other items of jewelry. In motion it is quick and sinuous, but its stops and starts in an unnerving staccato manner, one moment as still as a statue, the next a blur of activity. This vast creature resembles a massive floating brain with dozens of green tentacles extending from its central mass. Each of its tentacles ends in a hideousgulping maw. Electrical impulses course over its surface, perhaps ushering commands to the probing and writhing tendrils which seem to cavort and flail by some mad design. The whole mass seems to glide effortlessly and must surely be buoyed by supernatural means. A ball of blistering heat surrounding this automaton is palpable. At its center you can discern a dark grey humanoid shape, only slightly taller than a human, but proportionally built like a stocky dwarf. The surface of the figure is featureless, in fact it seems to bubble and ripple as if constantly boiling. This automaton is humanoid in shape and fully twice the height of a normal man. Its fashioned from a dark coppery colored metal in the semblance ofwhat could be an ancient armored warrior, although its exact origins are unknown to you. Unless stated otherwise, all content © 2001-2005 Craig Cochrane. All rights reserved.